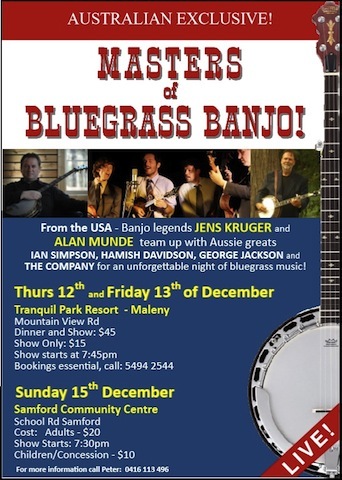 The Australian Bluegrass Blog caught up with Peter Nahuysen this week to dig a little deeper into the recent announcement regarding the 2013 Banjo and Bluegrass Conference. I asked him a few questions. Ed: Firstly, congratulations on this announcement. Alan Munde is one of my absolute favourite banjo players and Jens Kruger, well simply a phenomenal player and musician, two of the best banjo pickers of all-time, both to be at this year’s December conference? Peter: Thanks Greg, that’s right both are coming and what an amazing opportunity we have, not only for banjo players, but for all bluegrass enthusiasts to see and hear 2 two of the greatest banjo players the world has seen. Ed: You announced in May that Jens was coming, but you were able to secure Alan Munde as well. Is there a bit of a story behind that? Peter: Yes, It was banjo player and teacher and conference regular Ross Nickerson who helped line up Jens for this conference. Ross had worked with Jen’s on his Florida Banjo Cruises and had highly recommended him. Jens committed to the conference in May which was when I made the previous announcement. It had been in the back of my mind to see if I might be able to secure another player as well, and Alan was also suggested by Ross and Bela Fleck with whom I had been in dialogue. Ed: As well as a legendary player, Alan is also a very highly regarded banjo teacher with his full-time banjo teaching in both Georgia and of course his Banjo College in Texas. I would imagine he would be very well suited to The Australian Banjo Conference. Now I notice you are calling it the Banjo and Bluegrass Conference? Last year we had “The Banjo Conference”, followed the next weekend by “The Bluegrass Conference” to include all the bluegrass instruments. Does this mean this year it is a combined event and will include instruction on other instruments as well as banjo? Peter: Absolutely. We didn’t get a full house last year for the Bluegrass Conference, but the format and level of enjoyment we had made it highly successful. So I am very keen to keep expanding the conference to include tuition in guitar, fiddle, mandolin and double bass. Ed: So who are your instructors for the other instruments? Obviously we can’t overlook the fact that “The Company” are booked for the conference as well! They will no doubt supply excellent musicianship and teachers for their respective instruments. Peter: Yes, I can’t speak highly enough of the calibre of musicianship of The Company. With the amazing George Jackson on banjo and fiddle, Jamie Clark is a lights-out guitarist, Michael Patrick is an amazing mandolinist and fiddle player, and Markus Karlsen is one of Australia’s finest double bass players. They will all be conducting classes on their respective instruments as well as in band technique and performance. Ed: That’s great news and a fantastic line up al-round. Are there any concerts planned? Peter: Yes, we will have our usual open to the public, in-house concert at Tranquil Park, Maleny which again will feature a meal and show option, and also a concert is planned for Brisbane on Sunday evening December 15th at a venue to be decided. Ed: I’m coming! So what again are the dates for this year? Peter: Thursday December 12th till Sunday December 15th, at Tranquil Park Resort, Maleny. The cost is $780 for players, and $590 for non-playing partners. The cost includes everything including food, accommodation, in-house concert and of course all the music you can handle! Ed: For more information or to book, contact Peter Nahuysen direct on: peternahuysen@optusnet.com.au or call him on mobile 0416 113496.